How is already almost Christmas!? I don’t even know. If you’re anything like me, you’re probably the worst gift-giver ever. You and I show up at places where everyone else is bestowing gifts, and we’re the ones awkwardly standing in the corner, empty handed because we either forgot, ran out of time, or lacked the creativity to think of something gift-worthy. On the upside, we did manage to find a really good sale on boots for ourselves earlier, so go us! I know, we’re the worst. But I have a solution. Nuts. OK, not just nuts, but nut butter! 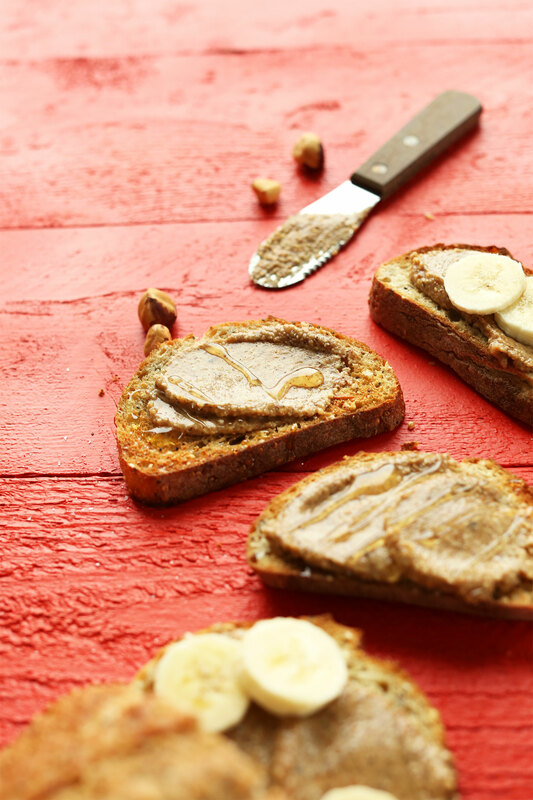 Everyone loves nut butter and it’s such a guaranteed way to make someone’s day. Plus, chances are they’ll actually use and enjoy it unlike some other gifts – which is the best kind of gift to receive. Here’s the deal with hazelnuts. They’re extremely healthy for you. Beyond just being high in protein and healthy fats, hazelnuts are the tree nut with the highest amount of folate (helps create normal red blood cells), they’re high in fiber (important for digestion), and rich in manganese (needed for bone formation) and copper (needed for iron absorption). They’re also high in biotin, which is a B Vitamin that helps grow strong, healthy hair. I rest my case. 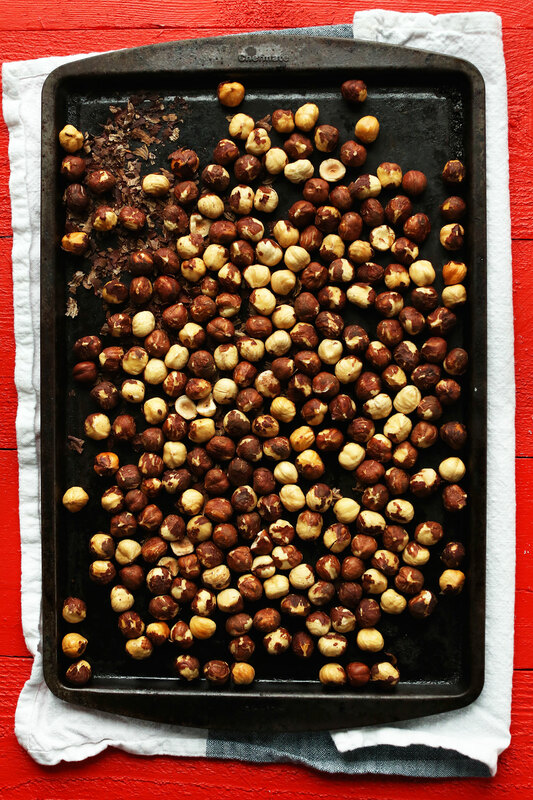 You need hazelnuts in your life. Not only do you get the health benefits of hazelnuts, you also get a dose of cinnamon, which everyone knows is high in antioxidants, has anti-inflammatory properties, and can lower blood sugar levels. Not to mention it tastes like the holidays. Lucky for you this edible gift requires just 3 ingredients and 30 minutes to make. And, it’s totally customizable. Sub pumpkin pie spice for the cinnamon for a more autumnal feel, or swap it for melted dark chocolate to go for my 4-Ingredient Vegan Nutella instead! Who would turn away Nutella? No one with good taste, am I right? Not only does this make a great gift (package it in little mason jars and wrap it with ribbon), it’s also a great spread to have around for things like toast, pancakes, waffles, and more. My personal favorite way to enjoy hazelnut butter is dipping a spoonful into roasted sunflower seeds and eating it right off the spoon! It’s also extremely delicious on bananas, rice cakes, and pretty much everything else. If you try this recipe, let us know! Leave a comment, rate it (once you’ve tried it), and don’t forget to take a picture and tag it #minimalistbaker on Instagram! We’d love to see what you come up with, whether you decide to gift it or keep it for yourself (no judgment either way). Cheers, friends! 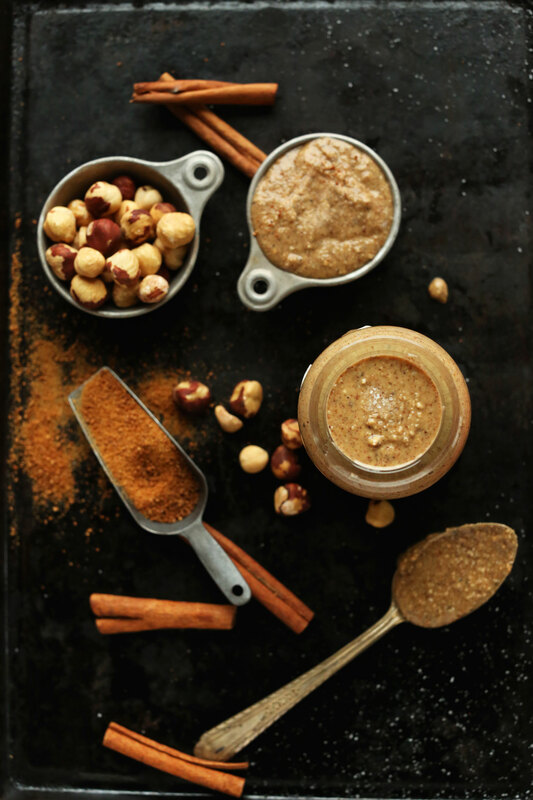 Easy, 3-ingredient hazelnut butter infused with sea salt, ground cinnamon, and lightly sweetened with coconut sugar. 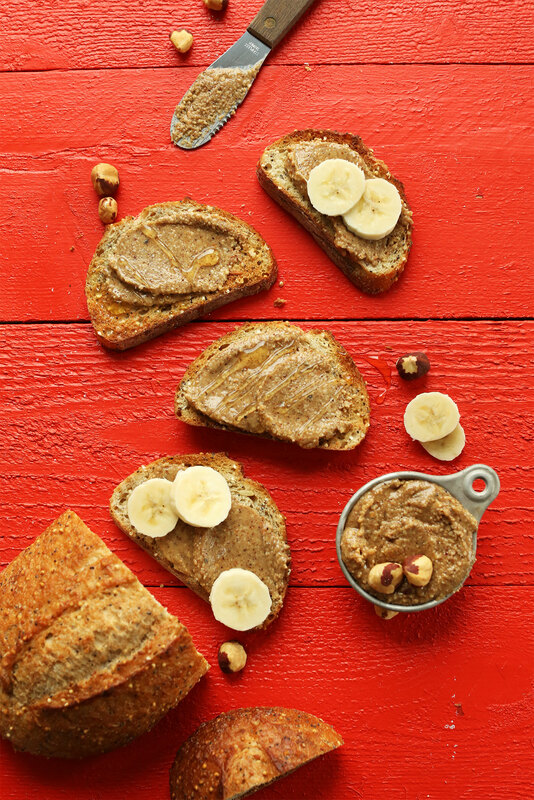 A nutrient-packed spread that's perfect on toast, pancakes, waffles, and more! Preheat oven to 350 degrees F (176 C) and add hazelnuts to a baking sheet in a single layer. Roast for a total of 12-15 minutes, or until fragrant and golden brown. Remove from oven and let cool slightly. Then transfer to a large kitchen towel and use your hands to roll the nuts around and remove most of the skins (see photo). 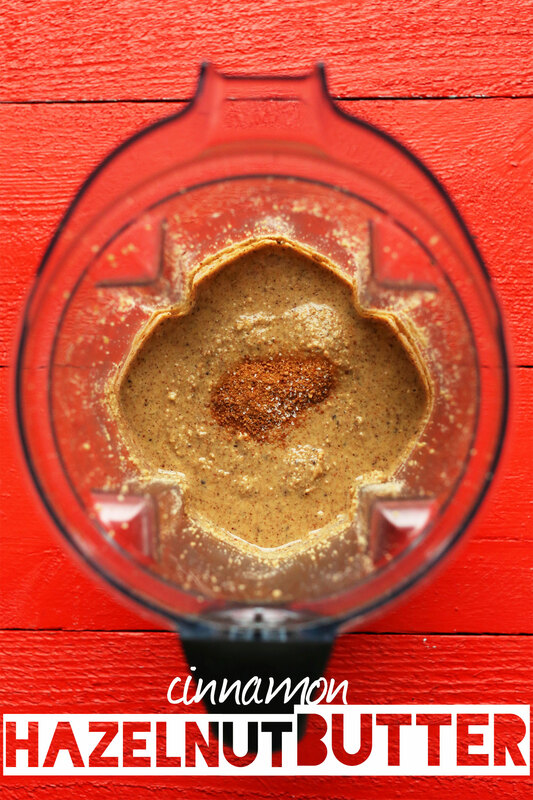 You want to get as much as possible off because it yields a creamier nut butter. But it doesn’t have to be perfect! 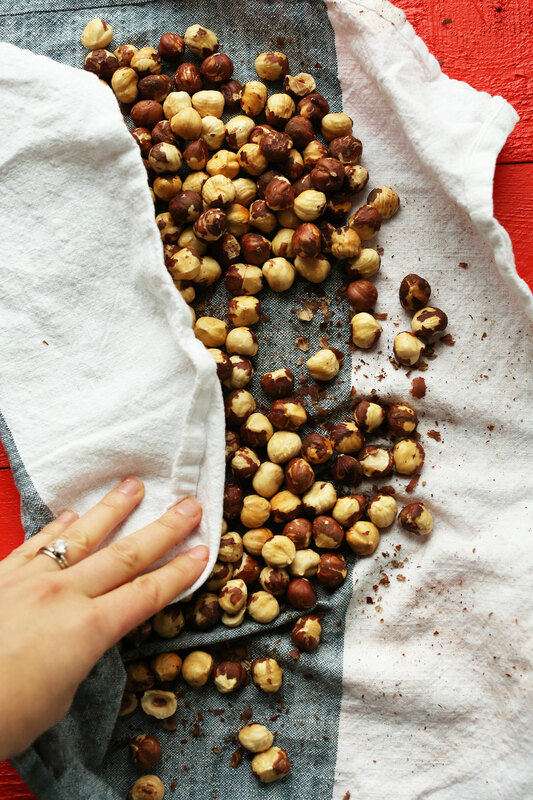 Leaving excess skin behind, scoop hazelnuts into a food processor or high speed blender. Blend on low until a butter begins to form - about 7-9 minutes total - scraping down sides as needed. Once the hazelnut butter is creamy and smooth, add the ground cinnamon, sea salt, and coconut sugar (optional). Blend/puree again until well incorporated. Taste and adjust seasonings as needed. Transfer hazelnut butter to a clean jar and store at room temperature for up to 3 weeks, or in the refrigerator for up to 2 months (or more). *Recipe adapted from my 4-Ingredient Vegan Nutella! *Nutrition information is a rough estimate for 2 Tbsp calculated without sweetener. *Recipe as written yields roughly 1 3/4 cups nut butter. Is the pound of hazelnuts in shell or deshelled? I made this 4 times now and have to comment. This recipe is really easy to make using a small food processor. I used Cylon cinnamon and the flavor is mouth watering, it keeps me going back for more! I do limit myself though. I gave some to my daughters and they both love the flavor too! Try it, you won’t be dissapointed. Hi there I was looking up how to make hazelnut butter and found your wonderful recipe. I was wondering if the nuts have to be toasted? Can I just blend raw hazelnuts? Thank you! Would it still turnout okay if I use roasted hazelnut flour to make hazelnut butter instead of whole hazelnut? I’m not sure.. we haven’t tried and can’t say for sure! I made this recipe a few weeks ago to revamp my breakfast. It was quite delicious. My only complaint is that I had trouble blending due to not have a food processor (I used my ninja – I was determined!). I ended up using a bit of water (no extra calories!) to get the ingredients to run more smoothly. Of course, not the fault of the recipe but keep this in mind if you don’t have a food processor. This is so amazing!! It’s really tasty, really easy and just delicious overall. And the combination with honey on top is just perfect! I also added some sliced apple on top. Thank you so much for this recipe, I love your blog and all your posts! Why can’t “Hazelnut Butter” be made as creamy as other Nut Butters. Can’t stand tiny pieces getting between my teeth. Also, I just want a Hazelnut Butter Spread (creamy) no grit… WITHOUT CHOCOLATE. Why does everything have to have chocolate, I’m so sick of chocolate in everything today. Anyway if you have an answer to these two questions, I’d really appreciate it. You wrote that hazelnuts is extremely healthy for us – but aren’t you destroying the fat acids and other nutrients when you roast them? Thanks for the recipe! I made this using Trader Joe’s Oregon hazelnuts and salt. Incredibly delicious. My mom also adores it. Just wondering when you say 2 Tbsp how many grams are you referring too? How did you estimate the nutrition facts? I saw Dastony Hazelnut butter says 2tbsp(28g) is 180 cals but that doesn’t seem right to me – especially since you can’t fit 28 grams of hazelnut butter into 2 tablespoons! *I would say for everyone that if you are making it in a toaster oven as I did you probably don’t need as high a baking temperature or as long a baking time. This is amazing…so simple and delicious! My favorite local cafe had a Hazelnut Latte special using hazelnut butter, but it’s no longer on the menu… I made this tonight so I can try to recreate it! Based on how yummy this is on its own, it’s going to be incredible. It’s OUTRAGEOUS how delicious this is. I much prefer it to Nutella. It feels so perfect for winter time, so warm and cinnnamon-y. Mine was quite runny so I’m not sure if I should have let it blend for longer or not. If I did, would it have thickened up? Still amazing either way! The longer you blend the thinner it gets! Also, pop it in the fridge and it will thicken. Sounds delicious! 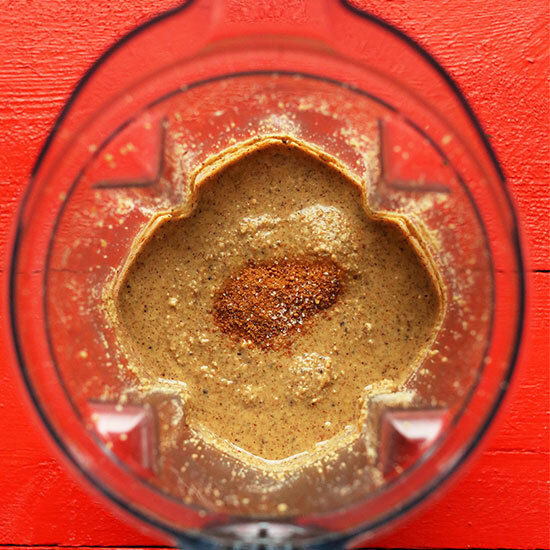 Can’t wait to make it in my Vitamix…have never attempted nut butters. Will drizzle with honey…yum! It might be the skins that are the problem. OR, your blender or food processor isn’t strong enough? If you’re left with nut meal, use it in baked goods! This hazelnut butter is simply divine! Thank you so much for sharing the recipe. I can’t believe how sweet it is without adding any sweetener whatsoever. The cinnamon is a delicious touch. I added about 1 1/2 tbsp of coconut oil to get a lovely creamy texture. It’s a new staple in my cupboard thanks to you! This is outstanding!!!!! I just made it today because it took me so long to track down hazelnuts in bulk (I ended up ordering them on amazon for $15/lb). I did add about 1.5 tsp sugar and found it to be too sweet, so next time I will just go without. Honestly I think its too yummy to give any away; my husband will have to fight me for it! But thanks again for another great recipe that I can add to my ever growing printed collection. Happy new year I am excited for what’s to come in 2016. This is fabulous! I have never tried to make my own butter before but I am hooked now! Too good to give away lol! Love your recipes! Love these seasonal flavors! That shot in the blender is to die for. The processing works MUCH faster when you roast any nut oder seed that you want to turn into nut butter first. Try it! I go on you blog once (or ten) times a day and every time I go on and look at your recipes, you can always make my day! I also love that in your gluten free stuff you never use corn! You are just amazing! Love this! The addition of honey on top of the nut butter? Ooooooo so good! Especially with cinnamon. Yum! A little something sweet on top is so delicious! Glad you agree. Agave makes a great vegan option as well. I have! It’s still delicious without the sugar! In other news….here’s a quick story for you. Was talking to the bulk manager of the nuts section of the grocery store and she was telling me that people buy macademia nuts ($16.99 a pound) and purposely mislabel them saying they are hazelnuts ($3.99 a pound). Isn’t that so terrible!!! I know I’m naive but I can’t believe people can be so dishonest. Nuts are a great present, I wish more people would give healthy snacks instead of nicknacks, mugs and things that just clog up the closet! Yes! Hope you love it, Emily! I tried Nitella and I hated it. It was so sweet all I could taste was SUGAR. I found it awful. I love hazelnuts, walnuts and like almonds if not whole. I would like to try this but was thinking of maybe just a little of dark amber Agave as a sweetener. Would that work in this recipe? Nutella is 55 percent sugar, which isn’t fun. But, this is a great alternative. I am trying to imagine what this would not be good with…and I can’t! It’s SO delicious sounding! This looks amazing!!!! Such a good idea!